Have you ever had a feeling of Déjà vu? A dim but persistent sensation of already been there, done that? An uncanny feeling that what you are experiencing is something you have gone through before? When I was in California, my friends had taken me to Muir Woods that are famous for their towering Redwoods. The Muir woods are near San Francisco, they almost touch the coast line, the trees sloping down to the Ocean. The route we took was the famous Highway One.It was a breathtakingly beautiful drive with the road curving through the green hills and the Ocean glittering in the distance. On our way back we drove up a steep hill to a viewpoint overlooking the Ocean. 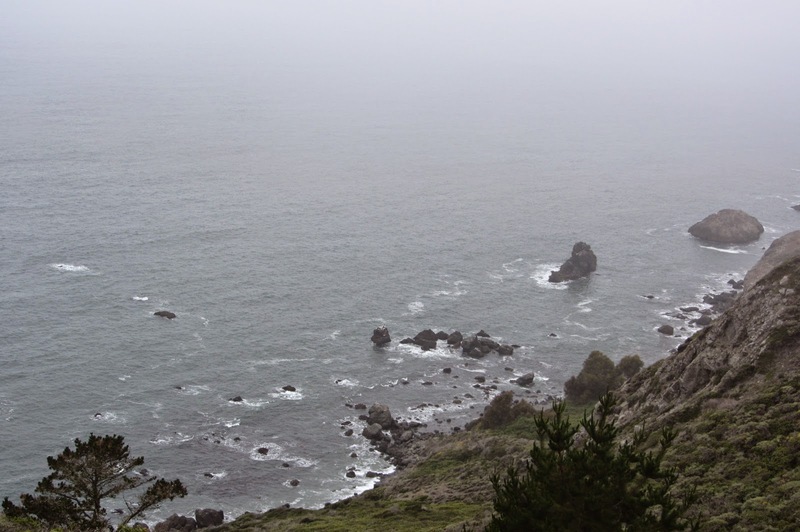 A steep trail led us to the top of the hill and there clinging to the rocks by the very tip of its fingernails was a small lookout, hanging almost precariously over the Ocean.We stood there looking out at the Pacific Ocean, vast and seemingly infinite, merging into nothingness. The sun was hidden behind a thick layer of clouds that day; the wide expanse of the sea was beautiful but desolately so. The sea was an iron grey and it matched the dull sky overhead. The waves pounded the surrounding cliffs almost savagely. The Ocean here was rugged and raw. Suddenly I had a strange feeling that I have been here before.That the wind whipping through my hair and the salty tang of the sea on my lips is something I have experienced before. Even the cries of the birds wheeling overhead seemed familiar. I remember thinking that I was standing on the west coast of the United States and it was Japan that probably lay on the other side of this seemingly endless span of water. Then with a jolt I realized why I had the feeling of Déjà vu. 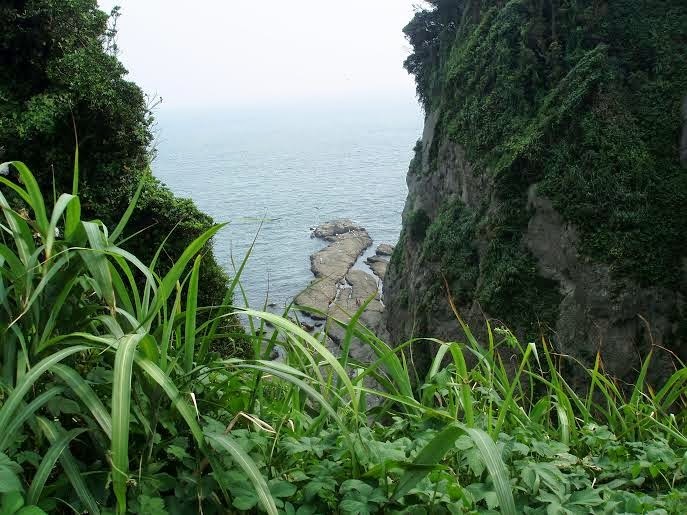 On the very tip of the eastern coast of Japan, about an hour’s train ride from Tokyo, Lies the Island of Enoshima. 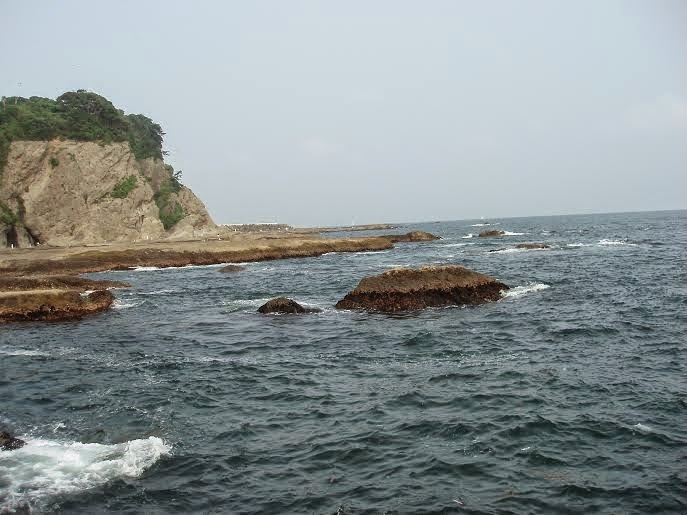 Enoshima is connected to the mainland by an ancient bridge. Centuries ago thanks to a major earthquake the island had almost broken into two pieces. I always liked going to the Island because it had some beautiful shrines and a monument to Basho, who according to me is one the greatest Haiku poets ever. Enoshima is rather small and one day I decided to walk to the very end of it. 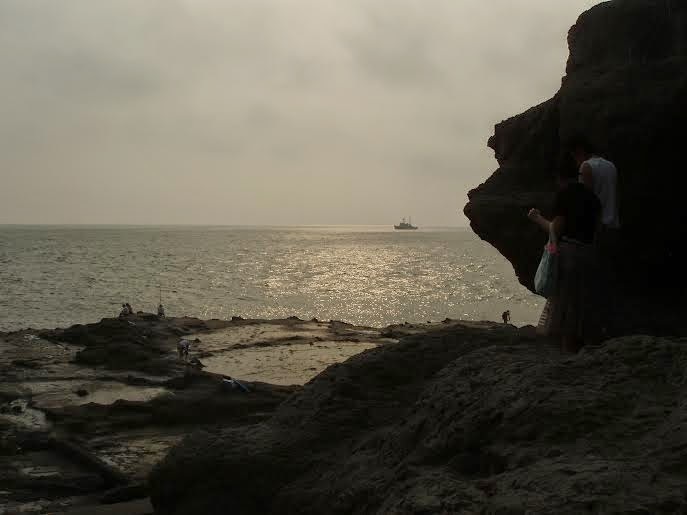 Once I had reached the Ocean, I perched myself on a huge rock half submerged in water. It was not a bright day, it had been raining intermittently and the sea was very choppy and speckled with grey foam where the waves hit the rocks. Even the birds flying overhead seemed to cry forlornly as if protesting against the unfairness of the weather. 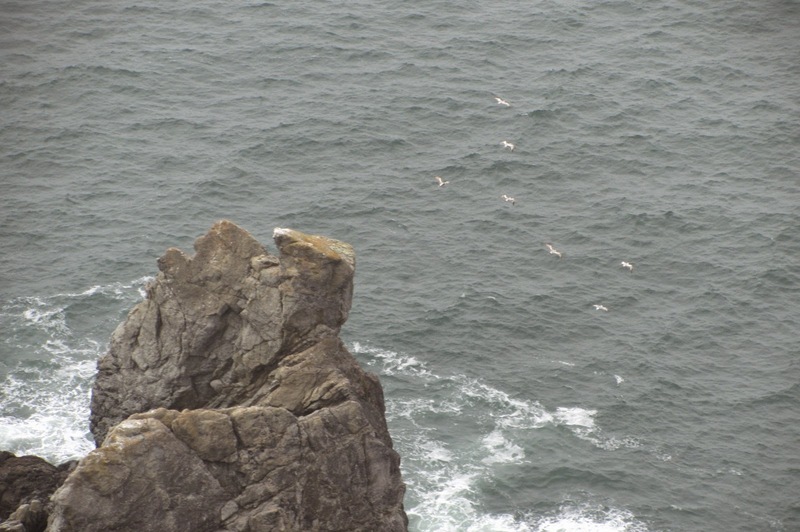 I remember thinking If these birds could cross the entire ocean that curved around the earth what piece of land would they reach? Then on the way back I saw a small board facing the sea that said in Japanese, “Next stop San Francisco”. And almost 8 years to the day I had sat at the tip of Enoshima looking out at the Pacific Ocean, I found myself at the other end of the same Ocean, almost facing that same piece of land. It is absolutely amazing the experiences travel can bring! I probably haven't said this, but I love your travel pieces. This is the third one I've read and your posts have this perfect harmony of photos and enough words to ensure that we, as readers get magically transported there. Artfully done, Ruchira. Thank you so much Sid. Delighted that you enjoy my travel posts ! I do love writing them ! Must have been a brilliant feeling that Ruchira! Loved this piece! Oh yes it was Kriti. I had Goosebumps ! Thank you ! Beautiful. This post is so lyrical and the experience so vividly described. Travel posts bring out the poet in you. They leave me thirsting for more. Thank you Ritu. More coming up. "A traveler in true sense" - You have made me very very happy today by saying that Jas ! WOW. It must be a great feeling to put it all together. And how exhilarating it must be to have rounded an entire ocean. phew! Oh yes, it was an exhilarating experience ! Wow, this was spectacular, the coincidence of it all. You did that scenic drive. It is my most favorite. You made so many beautiful memories come alive for me. That drive along the coast caressing the ocean is a once in a lifetime experience. Spellbinding your prose for this one. Yes, you travel! Oh I loved Highway One ! Thank you liking the prose here. You delight me with your compliments ! Wow... I don't know what to say...There is magic that you weave in these posts... Only you can do it Ruchira...I journeyed with you across the Pacific through this piece... Beautiful! Thank you so much Naba. You have made me so happy today ! Thank you Seeta. i Am so glad you enjoy the travel posts ! This post truly gave me the goosebumps with the lovely pics and the awesome narration. Echoing all the other comments here, your travel pieces are mindblowing. Never felt so, but this is magical. I felt like watching a documentary where the narrator is speaking about her thoughts. I did not feel this just as a blog post. Thank you Bhavana ! What a lovely thing you have said ! I almost had goosebumps when I read the line, "Next stop San Francisco". Really amazing how travel brings fascinating things. I feel so sorry and ashamed of myself. Living there, I never went to Redwoods. Call me on your next trip, we will go together :) You live in your travel posts. Oh yes ! Lets go there together ! Thank you for loving the travel posts ! wow! What a wonderful experience to look at that great expanse of ocean from both sides! 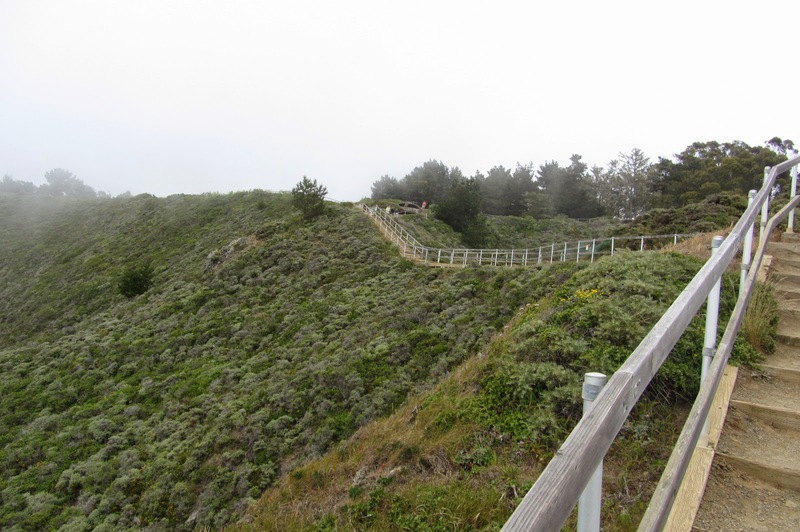 I have been to Muir Woods, the Redwoods and of course, Highway 1. It's such an amazing experience that we go again and again! Highway 1 is simply mind blowing. I loved every bit of my California part of the trip ! This post has such a lyrical quality to it! I cant even imagine what a feeling it must be to have been on both sides of the ocean, that too on days when even the weather is same! Wow! It was uncanny .. because the weather was almost the same ! It gave me goosebumps ! This is such wonderful writing, Ruch. If all travelogues were like this, I might just get serious about this genre! I absolutely loved this piece and the theme of deja vu you used in it. Brilliant stuff! My goodness ! To hear you say that this post actually makes you like this genre. Thank you Rickie, coming from you - this means a lot ! It was thrilling Shail ! That coincidence of Japan across the ocean gave me the goosebumps. Can sense how lovely your trip was. Wishing you many more such! The coincidence of Japan on the other side was indeed amazing ! FAB! wish that I could experience this too. I wish you do some day Janu ! I have had such Deja vu experiences and what actually gives me goose bumps is that I can make a complete circle out of it...I saw the same from your experience. That sign "Next stop SFO" and after 8 years you are here...amazing huh! Cheers to many such, Ruch! What a lovely thing to say. Actually your are right. They are memoirs in a way are they not ! The way it is described,one feels one is almost there. I can imagine that fantastic feeling of having seen the ocean from both the sides :) Exhilarating and your words just describe it perfectly ! Thank you Afshan ! It was truly exhilarating ! Thanks for taking on this beautiful ride through the California coast and Enoshima at other end! Thoroughly enjoyable , Ruchira! This post brought back so many memories. We had done the Highway One drive in 2012 and stopped at Pismo, LA and San Diego. And the nothing comes close to majestic Muir woods and the beauty of Yosemite. But when it comes to scenic drives along the ocean, I feel The Great Ocean Road in Australia is way more beautiful. Yosemite is utterly beautiful. That was one fo the best parts of my trip ! I have heard so much about the great Ocean road - I must go there one day ! Agree with Purba, Great Ocean Road is truly spectacular! I second that you travel there one day!